An 18-piece swing band made up of graduates and students of the Berklee School of Music and New England Conservatory, Thinkin’ Big has been bringing new life to big band music since its inception in 2010. Comprised of an impressive collection of New England’s most promising rising stars, the band performs classics from the American Songbook and vintage big band standards as well as a healthy dose of sophisticated originals. 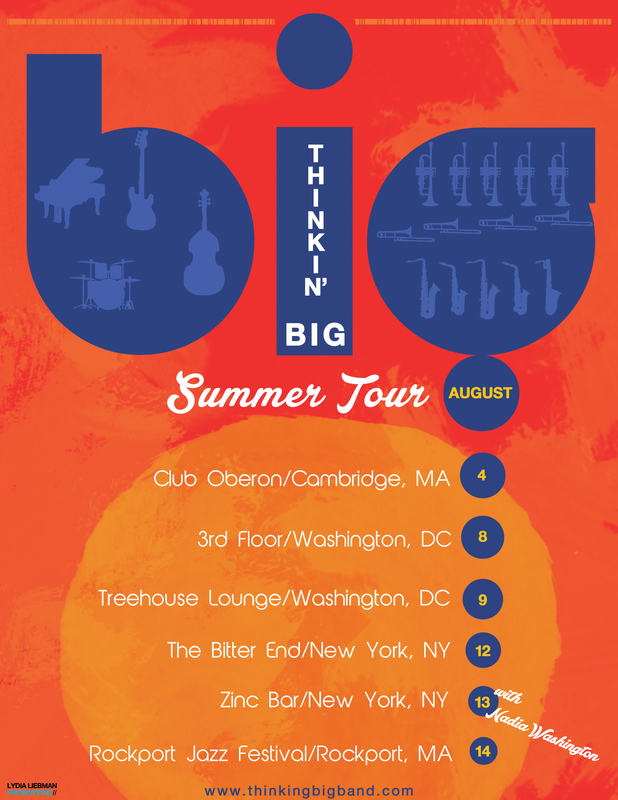 Thinkin’ Big is excited to embark on a multi-city tour this August which will showcase bandleader/trumpeter Jonah Francese’s innovative tunes and arrangements. The tour will kick off at the world-famous Oberon in Harvard Square in Cambridge, MA (where the band has produced two sold-out shows in the past year) on August 4. The group will then head down to Washington DC, where they will make two appearances: on August 8 at 3rd Floor and on August 9 at the Treehouse Lounge. Following their stint in DC, Thinkin’ Big will appear at The Bitter End on August 12 and the next night, August 13, at the Zinc Bar, where they will be joined by critically acclaimed vocalist Nadia Washington. The tour will culminate with a special appearance at the Rockport Jazz Festival on August 14. Chosen as the Jazz Rising Stars of this year, Thinkin’ Big is co-headlining the festival with luminaries such as Terrence Blanchard, Dr. Lonnie Smith, Wynton Marsalis and Ravi Coltrane, who will performing directly after Thinkin’ Big. Joining Thinkin’ Big for the tour is singer-songwriter Leah Rich, who has just released her debut album “Crazy Race”. Thinkin’ Big began as a way for Berklee and NEC students to showcase their own compositions and quickly grew into a dynamic ensemble that has become one of the most innovative and fresh groups playing big band music in the region. Thinkin’ Big is intent on not only keeping the spirit of big band music alive, but pushing it into new exciting directions. They have released three records, the most recent being 2015’s “Kaleidoscope”. With styles ranging from swing, to funk, to latin, Thinkin’ Big’s unique sound pushes the limit on traditional expectations of a big band, defying categorization to create a modern-day large ensemble.